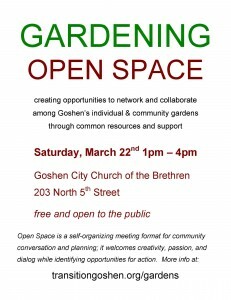 In March, a group of local advocates organized a Gardening Open Space to explore opportunities to “network and collaborate among Goshen’s individual and community gardens through common resources and support”. Ideas ranged from “work for food” opportunities and gleaning programs, to food forests and greenhouses. But the two ideas most widely supported were a tour of community gardens to network and promote what’s already happening and a resource guide to help connect local garden resources, knowledge, and volunteers. Before moving forward, our hope is to meet individually with garden leaders to confirm the amount of broader support and need for a tour or resource guide. Are garden leaders really interested in connecting with each other? Are there clear needs for which they would welcome community support? Are there resources, expertise, or stories that they would like to offer the community? This entry was posted in food, Reskilling and tagged community gardens, Transition Goshen, urban gardening, volunteering by Phil Metzler. Bookmark the permalink.